Naturally remove sludge, odor, debris and decaying leaves with billions of bacteria colonies and 6 added enzymes; resulting in a cleaner pond, healthier fish, improved dissolved oxygen levels and reduced ammonia levels. Bio-Max contains activated barley. It is the only product that utilizes a patented process to combine bacteria cultures on barley. In tandem these ingredients help to remove and control sludge, odor, grime & debris. Bio-Max is safe for fish, plants, birds and domestic animals. Apply Bio-Max once per week. If a problem arises between routine applications, apply Bio-Max at the prescribed rate per gallon above up to every 3 days until the problem is under control. 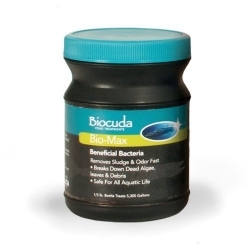 For best results apply Bio-Max directly into filter if possible or apply directly to the pond in an area of the greatest circulation.